How can you find the best public relations firm for your business? What should companies look for when they want to work with the best PR firms? I have worked with a ton of publicists throughout my journalism career with NBC and CBS. Now, as the owner of a PR firm, I see the other side of the business. I frequently speak with a diversity of business owners, entrepreneurs and large companies about their publicity needs and one thing remains consistent among everyone: regardless of the size of their business, most people ask the wrong questions when it comes to searching for the best public relations agency or publicist. If I were to hire a publicist, here are the questions I would want my publicist or PR firm to answer before I hired them, along with my reasons on what their questions reveal. This is a crucial question. You want to be able to see how the publicist thinks on his feet. I’ve asked this question to seasoned publicists for fun to get into their head. Most of them say, they need to research a strategy. That is an excuse for, let me Google to see what others have done and I will copy their ideas. A great publicist will have his or her own ideas. He will be able to explain a strategy off the top of his head because he understands the inside-and-outside of the media world. The ideal publicist will know how to communicate a strategy for your company because he will have the best ideas. But don’t confuse a solid media strategy with an understanding of your specific field of expertise or knowledge. Not every publicist will understand every industry within a few minutes, and that is okay. However, a great publicist will ask the right questions to determine what is the right media strategy for your business. He also should be able to come up with story ideas and specific tactics that detail how he or she will lead your media campaign. This question reveals how well the publicist understands your business or industry. Ask the publicist to explain what he sees as the unique value in your service. This is a valuable revelation because every publicity campaign will need to identify the unique angle that makes your business different from the competitors. 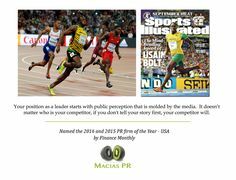 If the publicist doesn’t know why your business is different from your competitors, he will be at a great disadvantage when it comes to pitching the media stories. But don’t dismiss your publicist just because he doesn’t understand everything about your industry. I’ve worked with high-tech platforms that took me time to grasp. The bigger observation should be to identify how well this potential publicist or PR firm can comprehend difficult topics. TIP: Keep your question open-ended so the publicist can’t repeat what you say. Media placements are everything in the world of PR. I have secured stories in the New York Times, Good Morning America, CNN, Fox News, Financial Times, CNBC, New York Magazine, Cosmo, Entrepreneur Magazine. You get the idea. It’s a diversity of publications. A diverse portfolio suggests that your publicist knows how to identify a narrative, regardless of industry. It takes a special talent to secure media placements in various industries and if your publicist can demonstrate that with his or her portfolio, you are likely getting an experienced publicist who will perform at the highest level. Many business owners like to work with a PR firm that specializes in their industry. This can sometimes work against you in the world of publicity because ideas can become stale. Frequently, the fresh ideas come from a fresh perspective. If a PR firm has spent a lifetime in fashion or tech, they risk becoming complacent with their thinking and creativity. Once you see the media placements your PR firm has secured, ask how long it took them to secure those media placements. If it takes a PR firm six months to achieve one media placement, is that a time frame you are willing to wait for results? Most larger PR firms send in the great salesperson to get your business, but after the firm secures your account, they often pawn off the work to a 22-year-old college grad. How do I know? Because I used to get emails and phone calls from 22-year-old publicists who were fresh out of college even as their bosses took me out for after-work drinks. You have every right to meet the publicist who will be writing the pitches and selling your story to reporters. And whether you like it or not, reporters will associate the value of your business by how well your communications team interacts with them. Is your publicist organized and quick on his feet? Can he explain the specifics of how your industry? Make sure you meet the people speaking to the media on behalf of your company before you commit to a PR firm. Every PR firm hates these questions, but it’s a valid point to raise during your initial discussions. If you’re working with a publicist and the chemistry is bad or he/she doesn’t get along with you, you should be able to get a new person or get out of your account. Publicists are going to hate me for saying this, but I tell my clients, if it’s not working for you, I’ll let you out. I’d rather have a happy former client than a current unhappy client. (To date, no business has ever asked me if they could end an agreement early). I’ve clashed with some business owners because they wanted a media strategy executed their way, but after I explained my strategy and delivered media results, most of them deferred to my expertise when it came to the media. It’s okay to have a difference of opinion with strategy, but it’s another challenge when you just don’t get along with the person. Make sure you get insurance in case this happens to you. This answer can vary by the complexity of your campaign, but the PR firm should be able to give some guidance over a timeframe. The PR team might not want to give this hand away, but press them on it. There is no one right answer to this question because campaigns vary by complexity and size. But if you ask this question, at least you will have a time frame to hold your PR firm accountable. Experience matters when it comes to anything in life and it matters even more with publicity. Does your PR team understand your industry, its competitors and what is your unique selling proposition? Force the PR firm or publicist to sell you on their experience, and make them explain how this relates to the media. This will also give you an idea of how well your PR team will sell your stories to the media.